This is the "Strawberry bench". The solar-powered smart bench (yes, really) collects energy via a solar panel on its roof, and uses it to power a range of functions: monitoring air quality, disseminating information about the local area, offering free power-ups for the phones of passers-by. This summer, four of these benches will be installed around Canary Wharf, the privately-owned office and retail estate at the heart of London's Docklands. The concept was the winner of the "Cognicity Challenge", a competition intended to find innovative proposals to use technology to create smarter urban environments (and, as a side effect, make everyone feel all warm and fuzzy towards the Canary Wharf Group). The name, incidentally, has nothing to do with actual Strawberries. The company behind them is Belgrade-based Strawberry Energy, whose previous products include the "Strawberry Tree", a vaguely familiar solar-powered mobile phone charge and wifi hub with a bench attached to it. 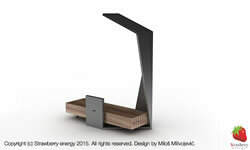 Both products were the work of architect Milos Miliojevic.